I was recently sent some lovely Iberian ham to try. First of all let me tell you about the 'Ibeham project'. Products certified under the seal of approval 'Protected Designation of Origin always come with a guarantee of traceability, origin, natural feeding and traditional elaboration processes, as well as the excellence of the end product. From pure Iberico pigs fed on a diet of acorns during the Montanera and granted DO status. These hams are aged for at least three years before being released and often labelled 'reserva' and 'gran reserva' to denote their age. For me these are the best Iberian ham I've ever had. Both hams literally melt in the mouth and are rich in flavour but the Jamón ibérico de bellota had the edge. It has a stronger taste than the Jamón ibérico cebo de campo which I'm assuming is to do with the pigs fed on acorns; but I'm certainly no food connoisseur. Jamón Ibérico is part of the renowned Mediterranean diet, which is considered to be World Heritage by UNESCO (United Nations Educational, Scientific and Cultural Organisation). Due to the exceptional breeding and feeding conditions of our Iberian pigs, their meat is rich in monounsaturated fatty acids, mostly oleic acid, high quality protein, potassium, zinc and vitamins B1, B3 and B12, which contributes to a normal energy metabolism, and it is also a source of phosphorus, selenium, iron and vitamins B2 and B6, which contribute to the correct functioning of the immune system. 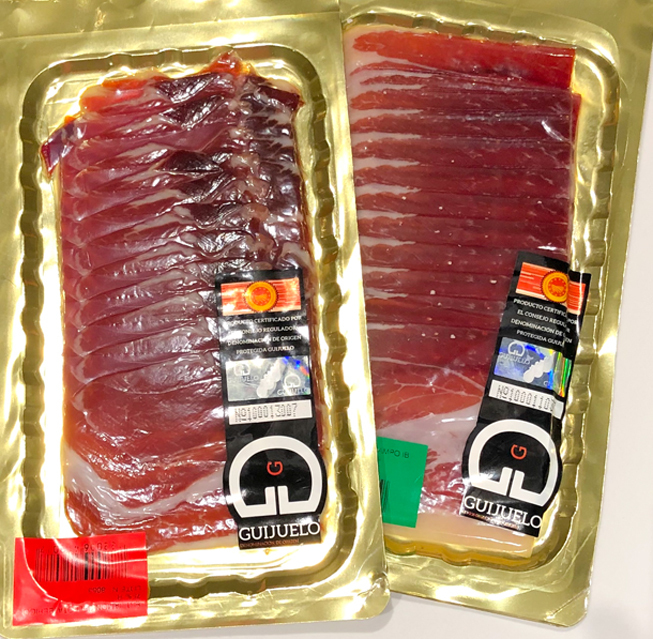 Iberian ham is undoubtedly a good source of energy that, along with a balanced diet and regular exercise, is recommended by doctors and nutritionists for their health benefits. You can read more over at the project website.